As the holiday season approaches, gift buying guides of all kinds begin to proliferate around the Internet. I thought I’d try my hand at one this year, for the simple reason that making lists is fun and is the next best thing to giving or receiving any bookish gifts. The holidays are the perfect excuse to treat our loved ones (or ourselves) to a luxury edition of a book they already own. 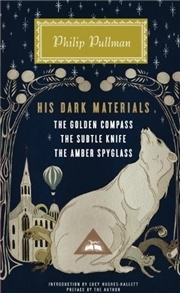 The Everyman Library edition of His Dark Materials is a perfect example: it has a gorgeous cover, a new introduction and preface, and Pullman’s memorable story in a single volume. 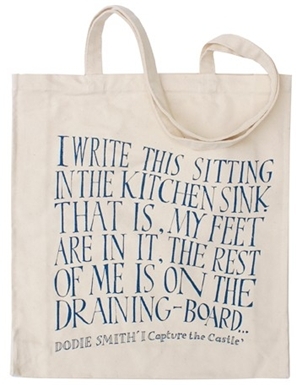 I Capture the Castle tote bag from the Literary Gift Company. Need I say more? 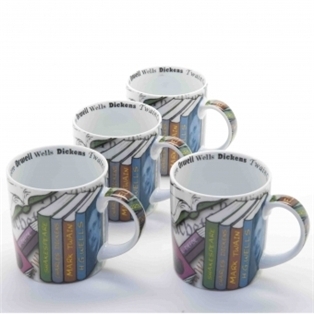 The Literary Gift Company offers plenty of other bookish treats. 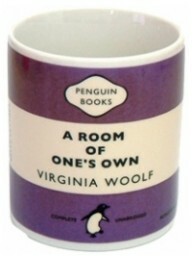 I love pretty much all of these Penguin Classics mugs, but if I had to pick a favourite A Room of One’s Own would be it. Bookmarks are probably my favourite bookish accessory, and Etsy is a perfect place to find unique ones. They have everything from this luxury cat bookmark to paper book monsters that can easily be mailed with a Christmas card. 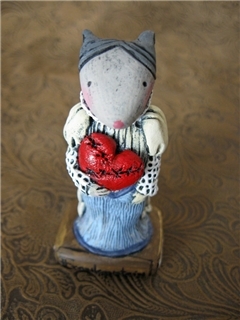 One of my favourite Etsy artists, Adorapop, sells a range of Victorian, literary and fairy tale inspired accessories. It’s hard to pick a favourite, but this pendant, celebrating Darwin’s bicentenary, particularly caught my eye. 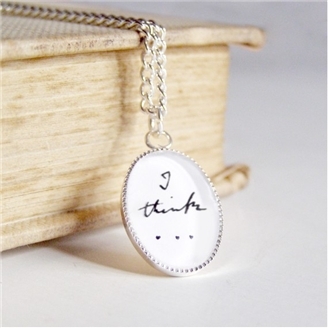 “I think…” are the words Darwin scribbled on his notebook above his first evolutionary tree in 1837. One last Etsy item: “Yay! Books!” pendant from ASnailsPace. The What The Dickens? 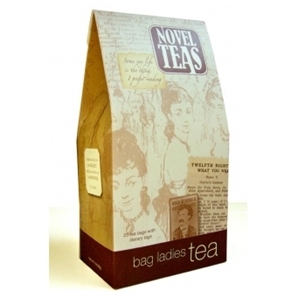 Writing and Literary Gifts shop sells a collection of “literary teabags” with quotations. 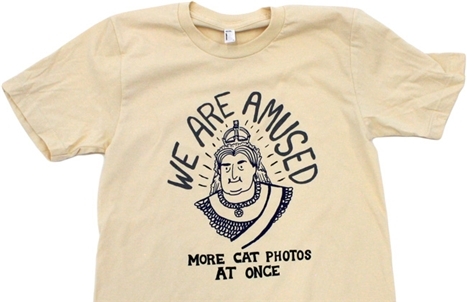 Over at Neverwear, Neil Gaiman fans can treat themselves to several accessories and other items. 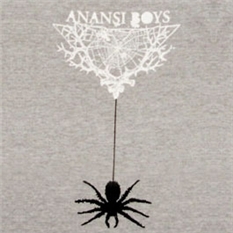 I particularly like this Anansi Boys t-shirt, but there’s plenty more where that came from. 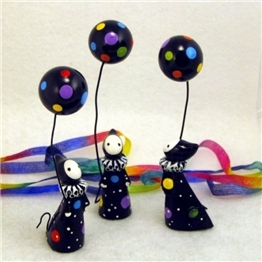 Lisa Snellings’ Poppets are also very popular among book bloggers, and in the early days of blogging they even became a sort of unofficial mascot. They’re not for every pocket, but they’re beautiful and look perfect decorating a bookshelf. 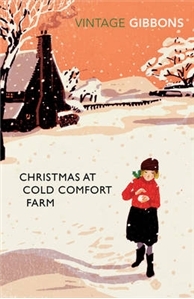 I couldn’t of course end this list without including a seasonal book: Vintage’s reissue of Stella Gibbons’ Christmas at Cold Comfort Farm sounds like the perfect holidays read. 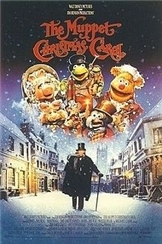 Finally, let us not forget seasonal DVD watching: as I found out only last year, The Muppets Christmas Carol is a cult classic for a reason; the Cranford BBC series just feels Christmasy; and there’s always the TV adaptation of Terry Pratchett’s Hogfather (starring Michelle Dockery, aka Mary from Downton Abbey, as Susan Sto Helit - this discovery led to much excitement around these parts), which I plan to watch this Christmas. Are you planing on giving (or hoping to receive) any bookish gifts this holiday season? Do any of these appeal to you? I love these! I really want to give some bookish gifts, but unfortunately I don't have any particularly enthusiastic readers amongst my "real life" friends / family. I'll have to ask for them for myself instead. :) I'll probably go with one of those beautiful editions you've featured - I love the Virago Modern Classics ones. What a great list - I think I'll just send the link to my husband! I love the mugs! I have to look further and see where they ship! Great list! A while back Tony got me a Hark A Vagrant shirt based off of the Brontes comic in which Anne looks on disgusted as her two sisters swoon over brooding men. I love it! Oh, I wish I had bookish friends and family members I could give these things to! The Everyman Library edition of His Dark Material is especially gorgeous. Oh, I want all of these things! I just emailed your post to my husband and told him to get to it! What a great collection of book inspired gifts! I hope I get a few! I'll take one of each please! I LOVE that cat bookmark. I looooove the book monsters. Can't believe shipping is $4 to outside the US though :P Sigh. I love this post! I may just forward people a link to this when they ask me what I want for Christmas, because I want everything here! I love the Neverwhere shop and Penguin mugs and I've been collecting those clothbound editions since they came out. You know which one I want,don't you? 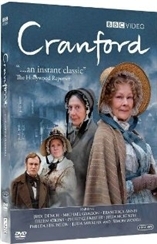 Christmas at Cold Comfort Farm of course! Some wonderful ideas! I have a Penguin mug - mine was a present from my partner, and it's Pride and Prejudice by Jane Austen! Meghan: Sadly it's the same with me! My mother reads and my father likes nature books, but they're not nearly enthusiastic enough for bookish acessories :P This is one of the reasons why I enjoy book blogger Secret Santa swaps so much. I couldn't join any this year but there's always next time. Steph: That's probably my very favourite Hark! A vagrant :D Your shirt sounds awesome! Eva: I really miss it too! And I miss my Poppets, which are in storage at the moment. Claire: Yes, isn't it beautiful? I also wish I had more bookish people among my offline friends and family. Zibilee: I hope you do too! If so, let me know! 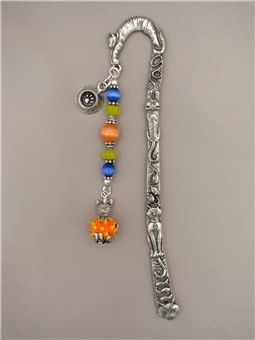 Sandy: I usually don't like metal bookmarks (they don't seem to stay in place) but that one is just so gorgeous! Kat: Glad you enjoyed it! Melissa: I want those Penguin clothbound editions so badly! Vivienne: Of course :D Only two more days until it's out! Tracy: A lovely choice as well! I am engaged in deciding to like Hark! A Vagrant! after all, after many months of ignoring it and not thinking it was that great, so I appreciate the link to the Hark! A Vagrant! merchandise. And that teapot is charming and makes me wish I drank tea. Great list! I love those mugs!! I saw some of those Penguin Classics at the bookstore and was SO tempted: they really are great covers. 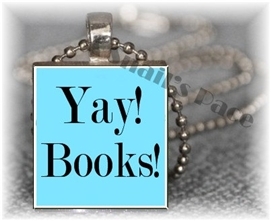 You have great taste in bookish gift ideas. Am off to explore your recommendations. So many temptations here! My favorites are the Penguin mugs and the Dickens teapot/mugs. So many lovely bookish gifts in this post! I'm tempted to get them for myself. I love both kinds of the mugs, the tea pot, the book editions, the Dodie Smith bag....gosh, all of it! lol Thank you for putting me into a Christmas kind of mood, Nymeth. It's good to have you back! Christmas at Cold Comfort Farm! Sounds like the perfect thing for everyone in my family this holiday season; we each need some cold comfort. Yeah I'm super selfish and want all of these myself! :D My friends are mostly non-readers but there are one or two who I know might like something of your excellent list! oh wow! I hope besides giving that you get some of those as gifts for yourself! There are also little gems at used book stores and thrift shops that can be found! I do think everything on this list would look spendid under your christmas tree!! I really must read Hogfather because I have wanted to see the movie for ages! What lovely gift ideas! I LOVE that teapot and cups! Wonderful post, Ana! I love that edition of 'His Dark Materials', those Penguin classics mugs and that teapot with mugs! 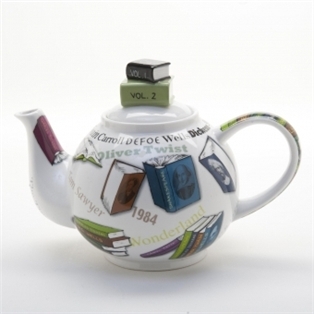 I want to buy that bookish teapot with mugs NOW! 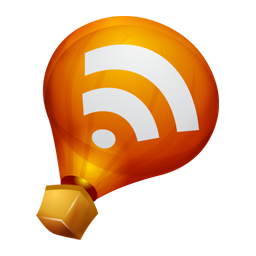 It's posts like this that make me particularly upset over the changes to Google Reader. I want to hit "like" and "share" soooo bad. Wonderful, wonderful suggestions! I'm over the moon in love with this Penguin mugs, too. If only they weren't so expensive! (At least, they were in New Zealand at $30 a pop. I assume they're a little cheaper in Canada.) Ditto poppets and gift editions of favourite novels. I hope my parents have picked up on my not-so-subtle hints as to how much I like the gift editions Barnes & Noble has released in the US. I'd love the Gregory Maguire and Anne Rice omnibi. Oh, I forgot to add that most of my family are getting bookish gifts this year, mostly because I have lots of perfect-condition hardcovers lying around. :) I've had a wonderful time matching each person with just the right book. I don't know which is my favorite! Maybe the teapot or the book mugs right below it. Great recommendations! I love the t-shirt.